If your organisation has multiple locations (data centers and/or offices), you may need layer 2 connections between them. In that case, Fusix’ virtual leased line gives you a virtual layer 2 connection between two (or more) Fusix on-net data centers and/or your office location(s), and is frequently called a “point-to-point connection”. It is useful, if you want to consolidate your network with the same security, reliability and manageability requirements of private connections. Using VLL service, you can achieve this goal without paying for physical connectivity between the data centers. Fusix offers fixed or dynamic VLL capacity, with Q-in-Q and jumbo-frame capabilities (Maximum Transfer Unit 9000 bytes). While a standard VLL configuration includes 1 port on each side of the VLL, it is also possible to deliver the VLL protected and redundant, meaning that it will use 2 ports per location. 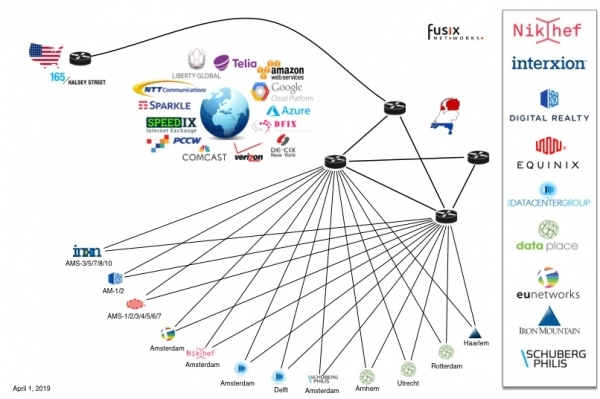 Our on-net locations are connected to the core routers in a form of a star, while all backbone components are deployed redundantly. This design provides 100% service availability and dramatically reduces the possibility of customer impact during network maintenance events or unplanned outages. Each on-net data center is equipped with 2 physical Arista switches, each of which is connected to a core router. IP transit service is always delivered on two ports while VLL services are delivered to customers on 1 port per location. For VLL service, in order to achieve redundancy (or “protected VLL”), we can deliver two circuits that run totally independently of each other. Within each pair of dark fibers, the two lines follow a different path regarding each other, which eliminates a risk of accidental damage of both lines at the same time. 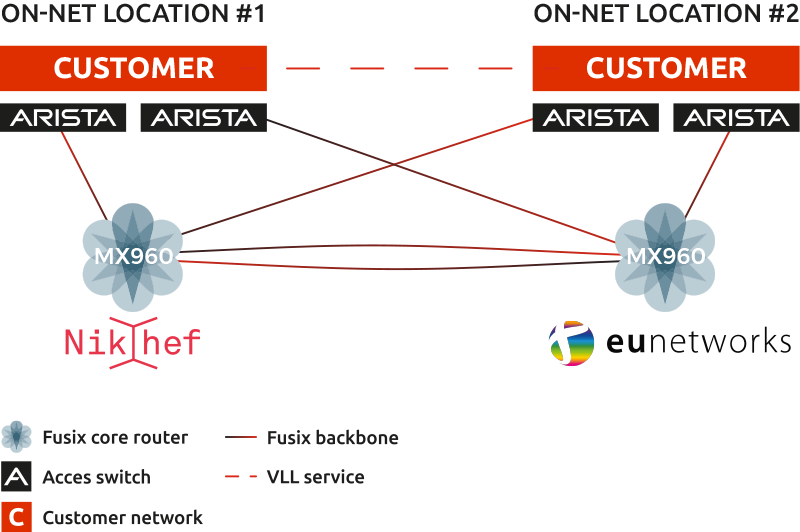 The core routers are Juniper MX960 devices that are located – for service continuity reasons – in 2 separate data centers: Nikhef and euNetworks. The result of the backbone design is the best service availability rate in the market.